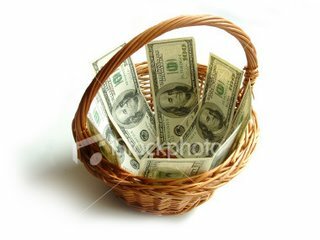 Today I am going to share with you another popular way for you to get more money and hopefully retire young. As I said before, there are a lot of ways for you to invest your money and time, these investment vehicles include property, stock market, mutual funds, online marketing........ I am going to talk about multi-level marketing today. You certainly know the big names in this business such as Amway, Nu-Skin......etc. I used to be like most of you, tired of daily work and having difficulty to breath at the end of every month because there are tones of bills to pay! I am disappointed with my pay and I have problems settling my credit card bills, phone bill, home loan.....etc every month. I am searching all available ways to improve my income. I met one of old high school friends when I came back from UK after my MRCP examination and he told me that he has found a way to double or even triple his incomes with only half his effort. I was so excited at that time because I almost spent all my saving after my MRCP PACES in UK. I have no ideas at all at that time what kind of business he was talking about but he seemed doing pretty well with a few offices in Indonesia, Hong Kong and China. My friend invited me to one of his company meetings and only at that time, I learned about MLM ( Multi-level Marketing). The idea of MLM is quite simple. You help a company to sell products , you earn commissions based on your sales of products or service provided by your parent company. However, the business becomes more lucrative if you bring more people to join you because the more your downstream members sell, the more you would get as commissions! So the philosophy of this business is simple and attractive, you should not aim to sell products, you can get more if you train people to sell products for you! I was totally amused by this idea! 1) If you are not the kind of person that likes to talk and promote products, it is a though business to venture into! 2) Certainly the earlier you join the business, the better. Why? Because I notice that when I approach my friends, half of them already joined the business and I couldn't find any new members. 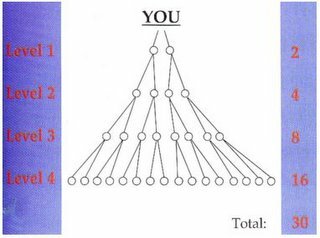 3) In order for you to be at the top of the pyramid, actually, you are stepping on many others under you to get the money. Therefore, there are 100 or even 1000 times more losers than winners in this business! 4) And the worst thing is the winner is always the parent company and not you! Therefore, I am thinking if I work hard for that company, why not myself starts a business and recruit people to help me to sell products and I pay them commissions? I always believe that in order for you to earn your money faster with only half your effort, you must leverage your time and money. I would talk more about this in my future posts. I think if you would like to join Multi level marketing, why not try to set up a company/business and franchise to others and make money from that! I think I might not be able to cover all my investment tips in 12 lessons, so I would give you another 2 lessons entitled 'Business and Intellectual Property' and 'Conclusion'!